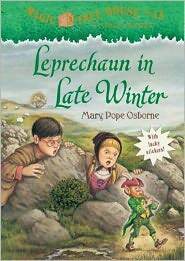 Jack and Annie are whisked back to long-ago Ireland. Their mission? To inspire a girl named Augusta to share her creativity with the world. But when they meet Augusta, Jack and Annie don’t see how they can inspire her at all—she is the least imaginative person they’ve ever met! Luckily, Jack and Annie have a special whistle that they can use to show Augusta a magical world. But their plan backfires! Can Jack and Annie rescue their new friend? Or will Augusta be lost forever? Addyson and I read this book in TWO days. We had just finished up book 42 and were leaving to go to Memphis a few days later. I had already picked up the audio books for book #’s 44-47 so we had to finish this book up before our road trip so we could listen to those books along the way. This was a cute little story that definitely tapped into her imagination.